There is a new place in town and it offers bursting bubbles and milk teas. I was never a fan of milk teas and I believe they are unappreciated. And maybe this time, I might like it. We visited J Centre last February and I think we have visited Cobo thrice already. Unfortunately, I always fail to bring the camera when I go out and this was the main reason why it took me awhile to post photos of what I had back then. Doddled walls. Spells FUN in all corners of the place. The tea wasn't that bad however mine had a stronger tea taste since I had less sugar in it. In all honesty, I sort of liked it. Might see myself coming back. We also had the Taiwanese Chicken. We ordered the Salt n Pepper and Mexican Pepper n Salt at Php70 each. We would have wanted to try out the Fried Sharks Fin and Fried Pork Siomai yet we opted not too since the staff wasn't really sure if they had both. 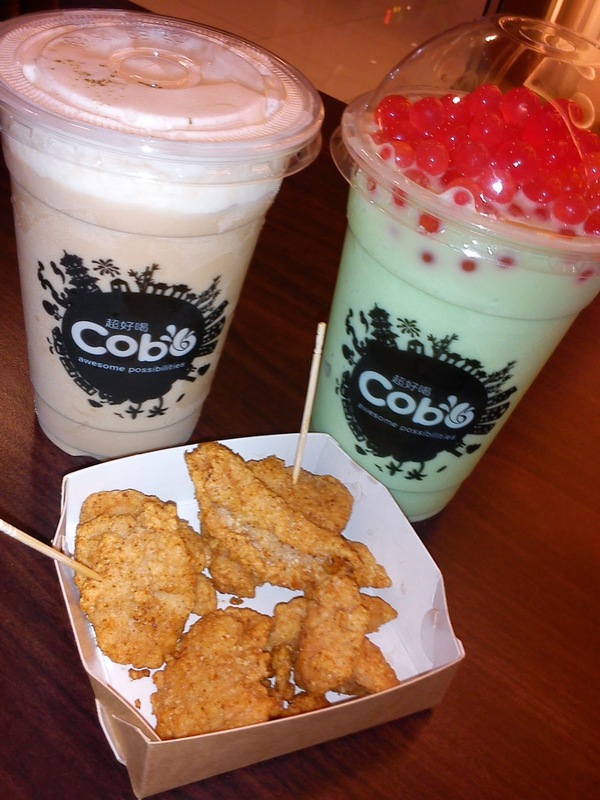 After more than a few weeks of longing for the elusive and really intriguing Seasalt Milk Tea we finally visited Cobo. Then finally, we went over today! Went straight to taking photos before I ever forget and ordered my share of milk tea. My companion wanted to try the bursting bubbles and why everyone is talking about it! She opted for the Honeydew Smoothie. We also went for the Mexican Pepper n Salt since it's a favorite and waited for it to be served. The staff were really nice, this is one of the reasons why I love this place. The interiors were well colorful and would definitely lift up everyone's spirits. The honeydew was truly refreshing. This is something I would drink on a warm hot day which is mostly any day here in Cebu unless it rains. The bursting bubbles were a real treat! :) It was surprisingly fun to eat. A surprising explosion of juicy concoction. I asked where they get these bobas and the friendly waitstaff told me that they import them from Taiwan. And my Seasalt tea was truly worth the wait! It was really great! I was waiting for the salty taste however what surprised me was the silky semi-salty cream that captured my tastebuds and currently longing for more. All these for Php225. It was worth every cent. That's too bad, Mustachio. You noticed the green thing on the cup? That was the sea salt.